1. First and foremost...is a studio of sorts. 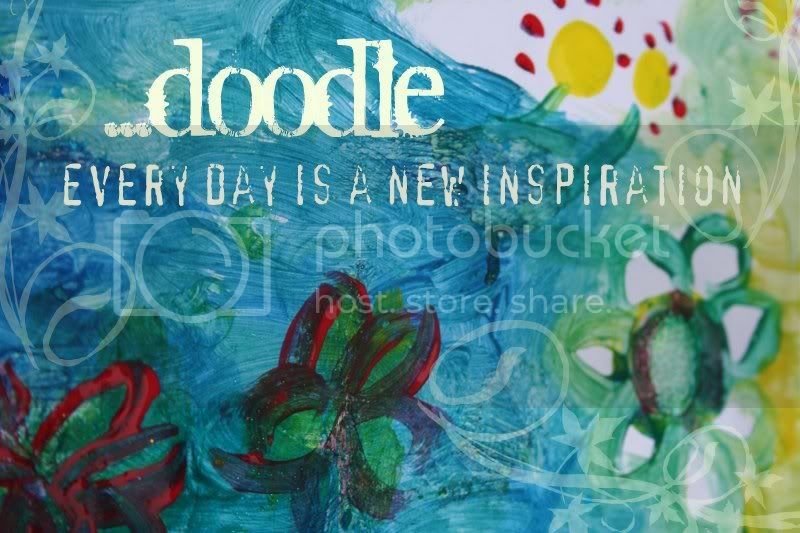 Organize the creation station, make it (a wee bit more) inspirational and create an artful life. 3. Design some more Kenzie clothes. 4. 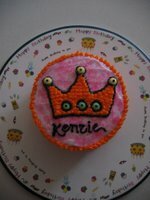 Plan Kenzie’s 2 year old birthday party! 5. 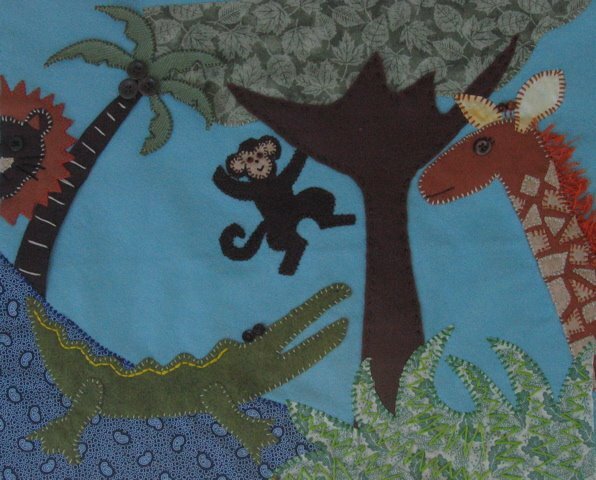 Design a wall art for Andrew Brown, our newest cousin and first nephew! 6. 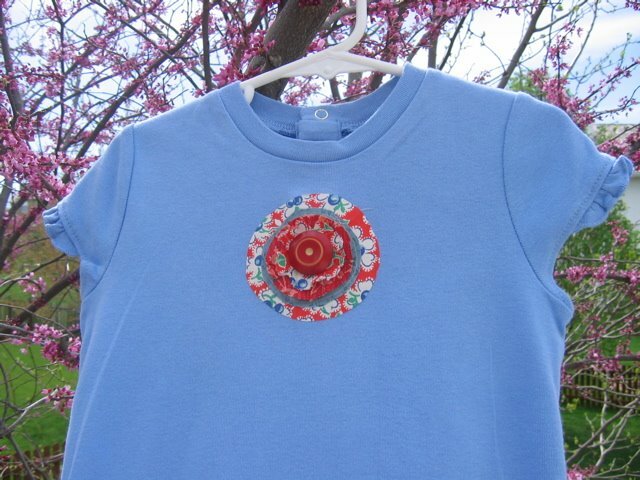 Try out freezer paper transfers! 7. Design a Cousins Communication Journal. 11. 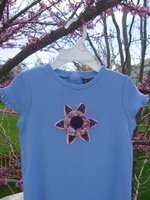 Explore Iron-on Transfers for Color Fabrics (using my HP Photosmart inkjet printer), and use other dyes and machine stitchery to personalize/embellish fabrics. 12. Try making marble magnets like: http://www.notmartha.org/tomake/marblemagnets.html. 13. 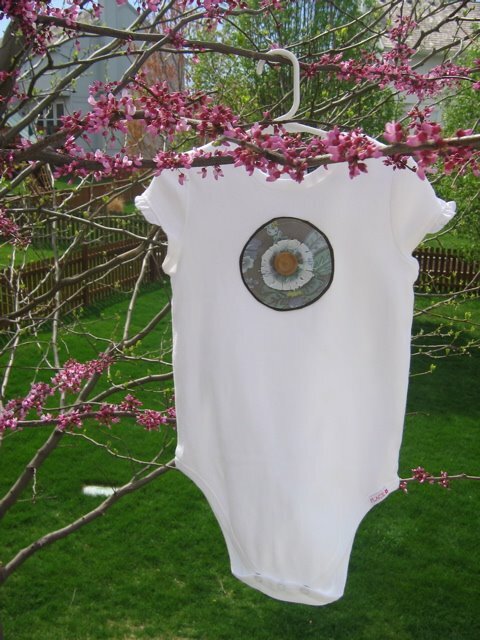 Design an art smock for Kenzie out of Oilcloth. The budding little artist in her quickly makes a mess out of a good outfit! 14. Restart The Artists Way Book, as I got interrupted by our relocation. Prepare to be inspired. 15. 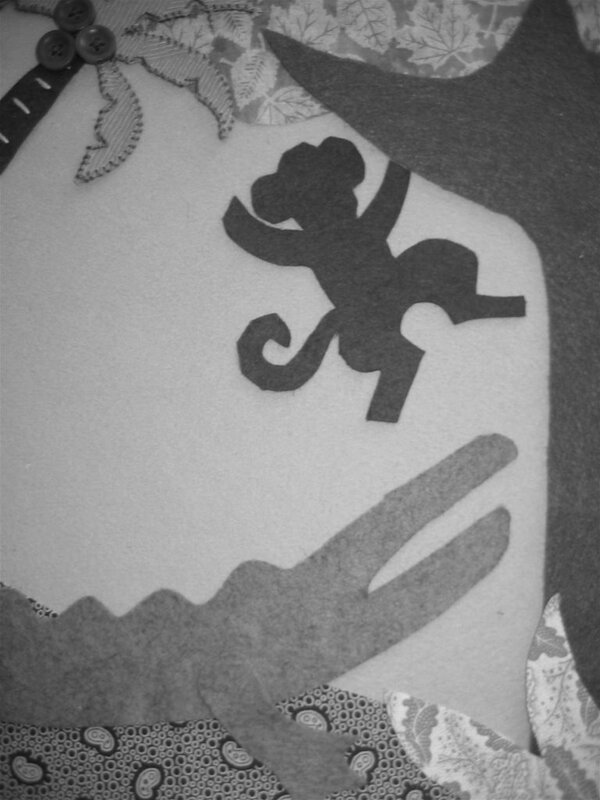 Create a puppet show and puppets for Kenzie. 16. 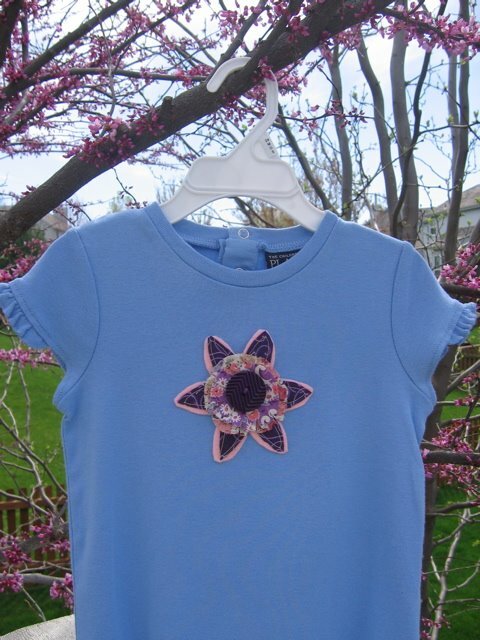 Explore lettuce edging, freezer paper, fabric and button embellishments on T-shirts (for Mama and Kiddo). 17. Redesign my blog with updated links giving credit to several of my bloggy friends. 18. Sell (gasp!!!) some of my stuff. 19. Exercise and create with Kenzie every day. 20. Get out my paints for Gosh sakes!!! 21. Use my "favorite's" lists at flickr to expand on and tinker with those ideas. 22. 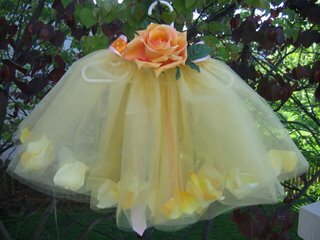 Design some princess skirts as gifts. 23. Make some more hats. 25. Re-do some furniture pieces. 26. Plan Kenzie's transition to a big-girl bed/room with focus on eliminating allergens. 27. 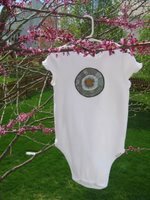 Make some pillow-case dresses for Kenzie. I saw one that I plan to copy the idea of soon! 28. Send some gifts to some of my favorite bloggers, who have gifted me with their creative goodies. 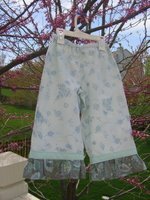 I got a good response to the little princess skirt I made for our friend's daughter, and many suggestions that I make them and sell them. I also got an email from a lady on flickr, which asked if I'd sell her one. While emailing the lady about making one for her - I tell her I have the product for one other skirt. And, how about if I make it and see if she likes it. She said she'd prefer it in pink....but I say...well this one is going to be yellow. Let's see if it will work for you and then I can buy stuff for a pink one if you don't love it. I made it. It's adorable. She still wants pink. Chuckle, chuckle. I told my husband the story last night and he laughs at my salesmanship abilities. He likens the above story to going to a car lot and asking to buy a car. "I'd like to buy a car," you say. And the salesman replies: "Oh, how about a truck?" "or a go-cart," "or a motor boat, maybe??" "Or, this nice wagon?" Duh, if a lady asks for pink. Give her pink. It measures: 12.5 inches from waist to bottom. Waist: is 14 inches of stretchy elastic. This will fit a toddler sized child and serve as a princess skirt, or a older child as a tu-tu. I'll pay for postage in the U.S. If it's an international mailing - we can work something out too! 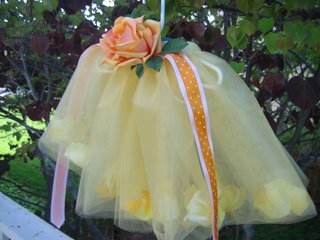 It's a glittery gold/yellow, with yellow flowers. 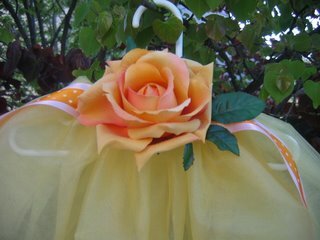 It has a pinkish/orange rose. Pink and orange pokka-dot ribbon tie. I LOVE it. And if you'd like one made especially for your little princess - feed me the details of your preference. I promise not to try and talk you into YELLOW! 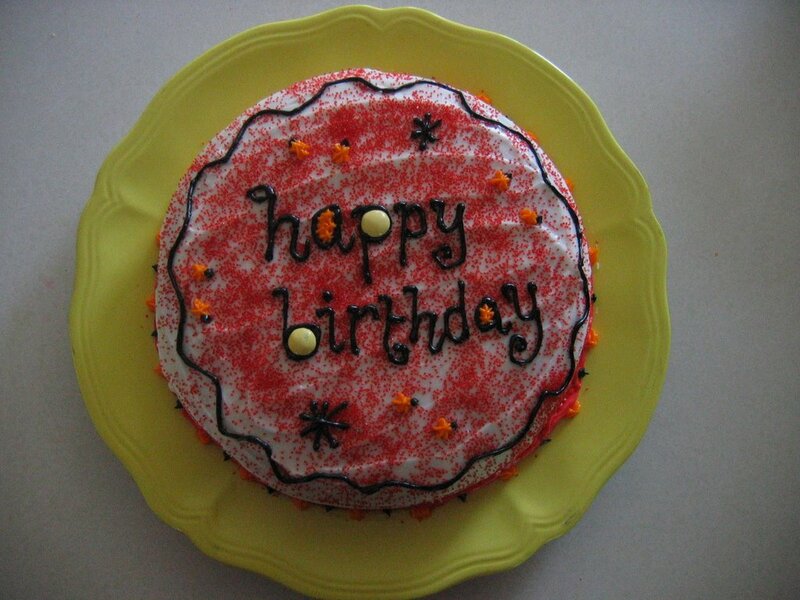 Drunken Mama's should not decorate cakes. We had to attend a birthday party on Saturday (for our little buddy Mia), and I had procrastinated the making of the birthday cakes for our own toddler's party. So, following toddler #2's party -- and a few too many beers -- this is what happened to my daughter's birthday cake(s). I also started decorating at 10:30 p.m. It was bound to go bad!! We had the big people's cake. 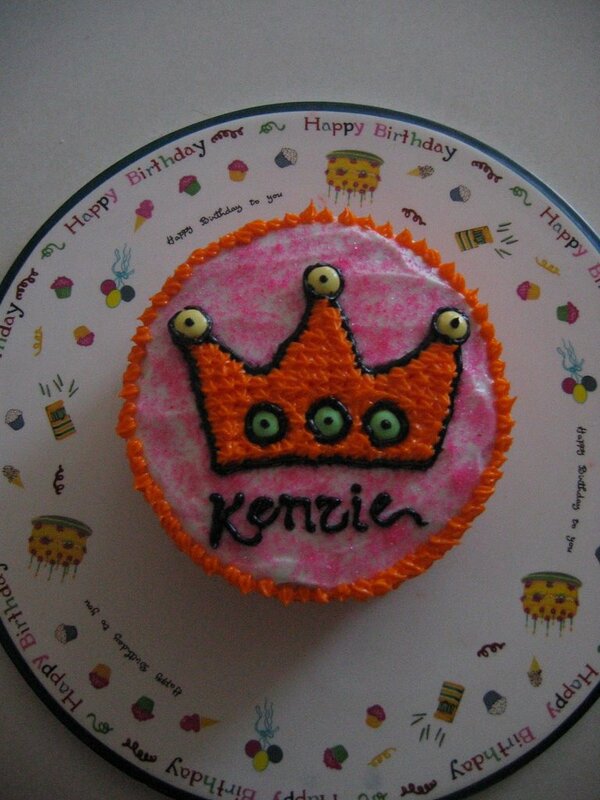 We had the Kenzie Doodle's cake. 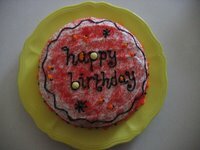 (I make her own cake, so that she can stick her little fingers in it and make a big 'ole mess). 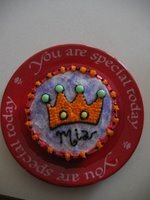 And, finally, we had the Meemer's (Mia's cake.) She shares a birthday with our daughter, and she got her very own cake too! Last years ladybugs are the standout favorites. Next year, Mama will not be mixing beer with late night cake decorating!! Those are supposed to be princess crowns. And, note to self: when things go bad...M&M's and sugar sprinkles are not going to save the day!! My daughter was gifted a darling princess skirt from her Nana some time ago. She also shares her birthday with another little girl, born to close friends of ours. 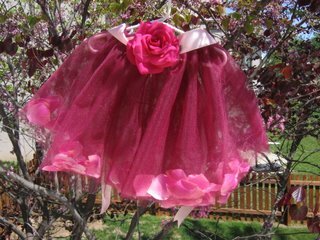 I replicated Kenzie's princess skirt for our little Princess Meemers (Mia) -- as a birthday gift for her. 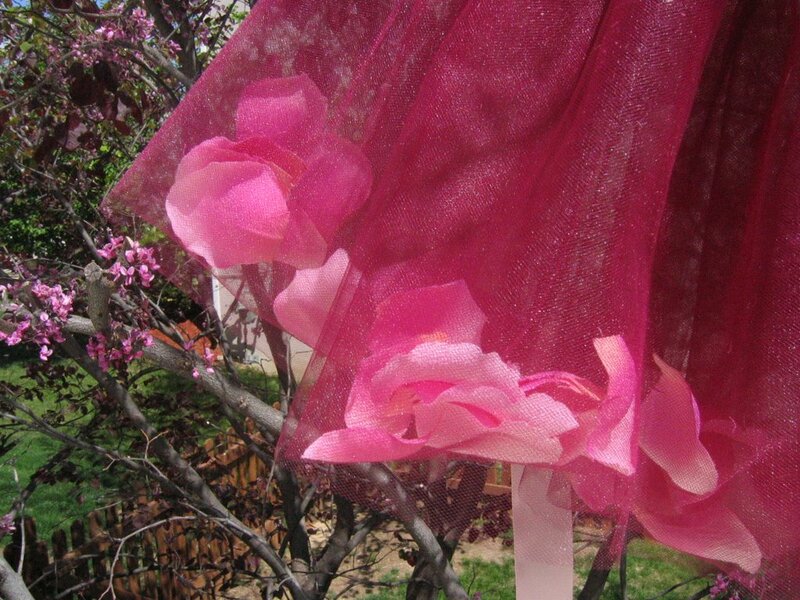 The skirt is made of colored netting with flower petals trapped in the layers. 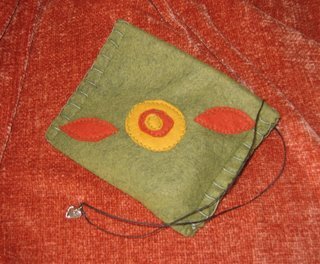 It's sewn with clear thread, so the seams are invisible. There is a ribbon tie, and a flower embellishment. I think it turned out perfectly!! I can't wait to give it to Princess Meemers!! 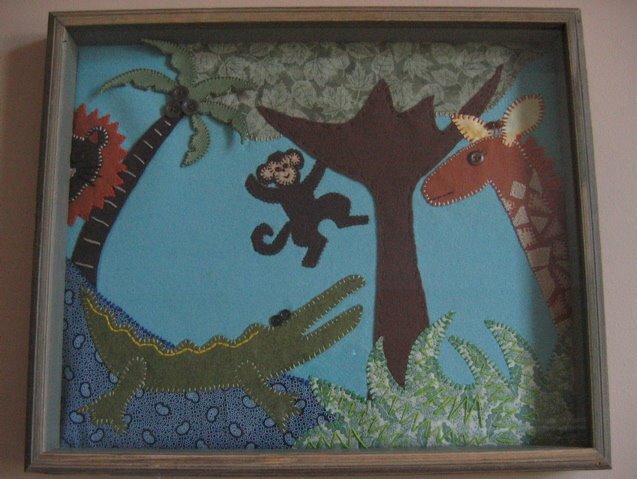 For our newest nephew, Andrew - I made another nursery wall art based on his room theme. Here's my little safari. I have to say, I'd like to evict the monkey. Other than his weird little face, I'm happy with the piece. I took a different approach this time minus the layering that I've done in the past. I think the layering style resulted in a more unique and interesting piece. I've got a very special project underway...but these babies take me weeks to do! Here's a very disguised sneak peak!! Wish me luck and absolutely no SORE wrists. 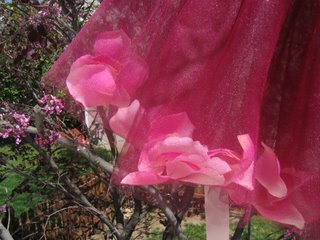 My sewing projects of the past weekend resulted in stiff and achy wrists (and whining). I refuse to consider carpal tunnel. No, no, no!!! I'm excited about this little wall art piece. I hope my "vision" comes to life! Finally, I used fabric scraps to embellish two other store-bought tees. 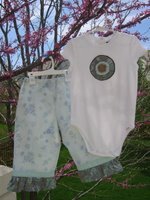 All items were from our stash (including the tees, which were bought a while ago by Kenzie's Nana). I’m the winner of some of Maize Hutton’s amazing generosity. I won last Tuesday Trunk Give-Away and promptly received the following darling loot! It’s so amazing to me that Maize gives so much of herself. She has such a gift with creativity and I love to witness her creations. But, GIVING her stuff away to random people who do nothing in return to her (except dedicate blog posts to her, I guess). What a gal! Go buy some of her stuff! !